As the BJP released its Sankalp Patra, Union Finance Minister Arun Jaitley said it had not been “prepared with the tukde tukde mindset” or “Ivy League mindset” but with a “strong nationalist vision... rooted in Indian reality”. With Prime Minister Narendra Modi declaring “nationalism is our inspiration”, the BJP Monday promised to remove Article 35A, a decades-old order that grants special rights to the people of J&K, oust illegal immigrants by implementing the National Register of Citizens (NRC) in a phased manner in the country, and turn into law the Citizenship (Amendment) Bill. It is the first time that the party manifesto has mentioned Article 35A, calling it “an obstacle in the development of the state”. As the BJP released its Sankalp Patra, Union Finance Minister Arun Jaitley said it had not been “prepared with the tukde tukde mindset” or “Ivy League mindset” but with a “strong nationalist vision… rooted in Indian reality”. The party stuck to its core issues such as construction of a Ram temple, abrogation of Article 370 and drafting of a Uniform Civil Code besides its “endeavour to secure Constitutional protection on issues related to faith and belief” (on the issue of allowing women of all age to enter the Sabarimala temple). 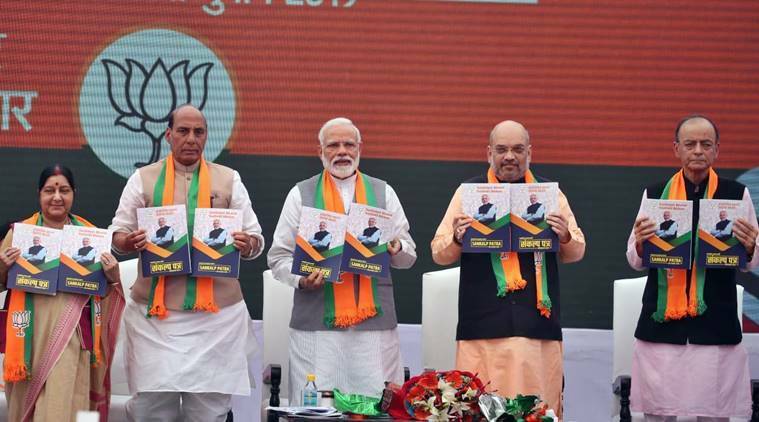 Prime Minister Modi, the only leader to figure on the cover of the 45-page document ‘Sankalpit Bharat, Sashakt Bharat’, released the Sankalp Patra at a function which was attended, among others, by party chief Amit Shah and senior ministers Rajnath Singh, Arun Jaitley, Sushma Swaraj. For the first time, party veterans L K Advani and M M Joshi were missing from the dais. The document begins with a section on ‘Nation First’ highlighting the “decisive leadership” of Modi that “fundamentally altered the national security paradigm of India in the last five years”. It lists zero-tolerance to terrorism, strengthening of armed forces, self-reliance in the defence sector, welfare of soldiers, combating infiltration and reinforcing border security. While reiterating his government’s commitment to the Citizenship (Amendment) Bill, Rajnath Singh, chairman of the manifesto committee, assured that it would protect the linguistic identity of every state. While Singh listed 75 milestones to be reached by 2022 when the country celebrates the 75th year of its Independence, Modi said 2019-24 would be a time to “lay the foundation” for 2047, the 100th year of Independence. Addressing the gathering, Shah reiterated that the BJP government had in the last five years fulfilled the promise of providing a transparent, strong and decisive government to the country.